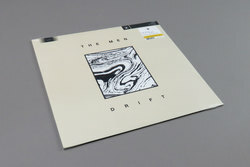 The Men - Drift. Vinyl LP. Bleep. The seventh LP from NYC punx The Men find the group taking their foot off the gas and exploring some interesting new sonic avenues. Though Drift sees the quartet back on Sacred Bones, there is only one number here (‘Killed Someone’) that matches the ferocious intensity of records like Leave Home. On the remaining eight songs, songwriters Mark Perro and Nick Chiericozzi indulge a far wider range of influences than they’ve done to date. Opener ‘Maybe I’m Crazy’ sets the tone - the vocal delivery suggests Nick Cave, but the instrumental is pitched somewhere between Suicide and Depeche Mode to create a freaky, oddly groovy track. Elsewhere there is Rhodes-led pseudo-schmaltz (‘When I Held You In My Arms’), jangle-pop (‘Rose On Top Of The World’) and country-rock (‘Sleep’). A mixed bag, in a good way.